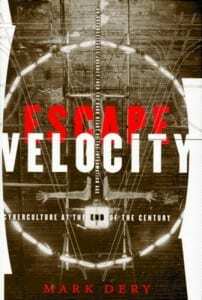 “An unforgettable journey into the dark heart of the Information Age, Escape Velocity explores the high-tech subcultures that both celebrate and critique our wired world: cyberpunks, cyberhippies, technopagans, and rogue technologists, to name a few. The computer revolution has given rise to a digital underground—an Information Age counterculture whose members are utilizing cutting-edge technology in ways never intended by its manufacturers. Poised, at the end of the century, between technological rapture and social rupture, between Tomorrowland and Blade Runner, fringe computer culture poses the fundamental question of our time: Will technology liberate or enslave us in the coming millennium? Mark Dery takes us on an electrifying tour of the high-tech underground. Exploring the shadowy byways of cyberculture, we meet would-be cyborgs who believe the body is obsolete and dream of downloading their minds into computers, cyberhippies who boost their brainpower with smart drugs and mind machines, on-line swingers seeking cybersex on electronic bulletin boards, techno-primitives who sport “biomechanical” tattoos of computer circuitry, and cyberpunk roboticists whose Mad Max contraptions duel to the death before howling crowds. Most “cyber-” titles are a breathless mix of New Age futurism and gadget-happy cyberhype.